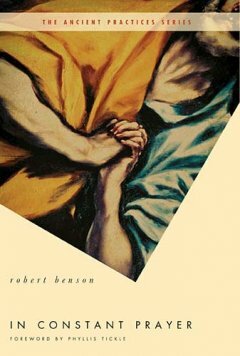 I‘M CURRENTLY hosting another (unexpected) giveaway over at my main blog – this time it’s In Constant Prayer, by Robert Benson. To enter, please leave a comment on this post at my main blog (click link). I’ll choose the winner next week. I am in the transformation period of being 7 days from moving up the steps of purpose (retirement) so I am intrigued in how I can revise my day with prayer extended and scheduled through out the day.